What happens when you combine two hot new technologies? 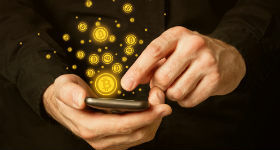 The team at SolidCloud has combined WebRTC and Bitcoin to build a new service, dubbed Bitphone. I spent some time talking with Michael Lauricella about the concept and the technology. Bitphone combines the use of the Internet currency Bitcoin with a WebRTC to PSTN calling capability. Basically, you use Bitcoins to put a certain amount of credits into your Bitphone account and then you can use those credits to make phone calls from a device using WebRTC to any PSTN phone globally. Essentially, Bitphone is a prepaid calling card that you can use from any WebRTC device. However, unlike a pre-paid calling card, if you decide not to use the remainder of your deposited Bitcoins, you can get them refunded back to your Bitcoin wallet at any time. The process is simple enough: Establish a Bitphone account using an email address, and transfer a specific Bitcoin amount from your Bitcoin wallet to that account. Now you can use that amount of Bitcoins to make calls. You use a simple dialer on a WebRTC browser to enter the PSTN number you want to call to and Bitphone places the call for you. The calling number sees a Caller ID from Bitphone and you get charged a fee depending on where you are calling to. Typical rates for U.S. calls are less than two cents per minute. You can also specify for Bitphone to call you PSTN as an option if you do not have good IP coverage where you are making the call from. The values of a concept like Bitphone are multi-fold. First, as you are paying with Bitcoins, there are no issues with credit card fraud. When you put money into your Bitphone account you are specifying a specific value of Bitcoins at the point of transaction, only the amount is transferred, there is no credit card number to compromise and the maximum value in the account is only what you put in (similar to buying a specific value pre-paid calling card). Another potential value is that there is a significant level of anonymity in the entire process. As Bitphone is not tied to a physical currency device like a credit card, the currency transfer is anonymous. This makes it possible for Bitphone to allow a user to establish an anonymous account through an anonymous email address. In fact, there is even the option of making a call and paying for it using Bitcoins without even opening an account, thought this is a one-time transaction. Clearly, Bitphone has both the IP address of the originating PC and the PSTN number of the dialed phone, but there is little correlation to the actual caller. Bitphone is still in beta, but the team sees the initial potential in global calling. For example, it is easy to create an account for family in Asia or South America and then let them call through a local Internet kiosk to someone in the U.S. As it comes through the PSTN in the U.S., it can be used anytime, not just for arranged times where both parties are on WebRTC devices and on sufficient network connections. It also can have a number of potential uses where anonymity in calling is important to one or both parties. The connection from WebRTC to the PSTN is not a new concept. A number of companies (AT&T, Voxbone, etc.) have already delivered services to provide gateways from WebRTC to PSTN. Other companies have delivered WebRTC to PSTN calling services—companies like UberConference have integrated WebRTC into a calling service that includes outbound dialing in their paid version, all of those have been based on credit cards or pre-paid cash transactions. Bitphone seems to be entering an interesting area by tying together the power of WebRTC with the innovation of Bitcoin.